Here at Keenpac we swapped our designing tools for tuneful notes when we participated in a spot of lunchtime carolling for charity. 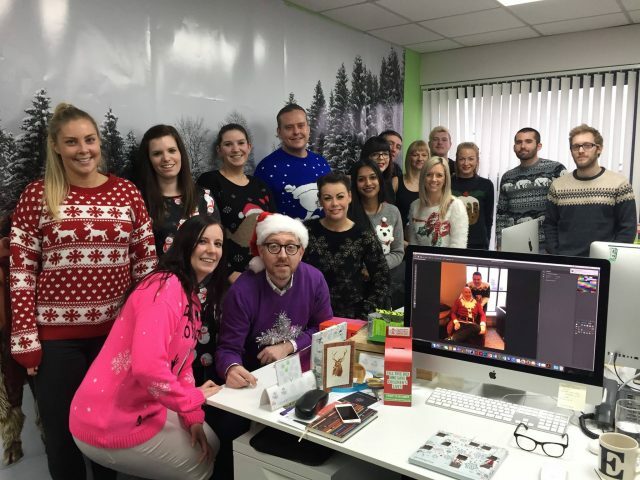 On the 16th December 2016, the official Christmas Jumper Day, Keenpac decided to raise some extra money for Save the Children – and after a few merry carols we had raised in total £60.76 for the charity. Head of Creative, Darren, took lead on guitar and Sample Coordinator, Billy, headed up the vocals – with the rest of the team joining in with the fun and merriment! From ‘All I want for Christmas’ by Mariah Carrey to Shakin’ Steven’s ‘Merry Christmas Everyone’ and Jackson 5’s ‘Santa Claus is Coming to Town’, the Keenpac office was filled with music and laughter – all for the good of Save the Children. Save the Children is the world’s leading children’s charity working in 120 countries. By providing education, healthcare, disaster relief and protecting children’s rights, the charity is helping to improve the lives of vulnerable children all around the globe. Whilst the team at Keenpac might not be heading to the X Factor finals this year, they sure put in a fantastic effort and showed great charitable spirt. Visit the Keenpac You Tube channel to hear the team in action!